MICROWAVE morsels in medium microwave-safe bowl on HIGH power for 45 seconds; STIR. If needed, microwave at additional 15-second intervals, stirring vigorously after each interval until morsels are melted. Stir in chili powder. 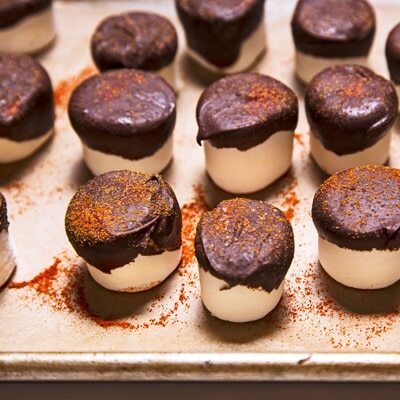 DIP marshmallows, one at a time, 1/3 of the way into melted chocolate and set on the prepared sheet, chocolate-side-up. Before the chocolate sets, sprinkle tops lightly with cayenne pepper. Refrigerate for 15 minute or until the chocolate hardens.